The technological progress in Africa is slowly but surely leaving its marks on the market – and it is a perfect example of how customer experiences are shaped from context. When Kevin and Dominik, the founders behind Fintory, started their first agency their first client was a financial institue from Africa. This project was not only the cornerstone for a long-term collaboration throughout the past years, but also laid the foundation for our purpose at Fintory. What many people don't know: The technologies of African financial institutions are much more advanced than in many other markets around the globe. This leads to interesting feature sets and innovative app ideas. Throughout the last few years we were fortunate to work with different startups, banks and finance institutions from Africa – who are not only pioneers in their home markets, but also helped us as a German company to gain key insights about how people interact with finance in the African culture. We're always curious about working with companies across Africa as it helps us to learn and gather interesting experiences that challenge our expertise. These experiences also played a role in why we founded Fintory. From our collaborations across Africa we learned to challenge the status quo and to re-frame problems – even if many of the digital product solutions that we build are far from imaginable in Germany, we try to apply our insights and approaches anyways. In the long-term that helps us building revolutionary products, also for a regulated Europe. The currencies that people in Europe are used to, say EUR, USD or GBP, hold more value than African currencies. The extra-ordinary exchange rates are a basis for the developments African countries are experiencing. A thousand USD convert to around 365.690,00 Naira, which is Nigerian currency. In Kenia one would own 101.406,00 KES. Given that the highest note that exists is merely 1.000 in each currency, you can imagine the struggle of carrying around cash for most every-day purchases. Even the production cost of small notes is higher than the actual value the currency holds. Now imagine you’re looking to buy coffee in Nigeria. That would cost you around 730 Naira, say around 2 USD. It doesn’t matter if you pay with the highest note or carry the adequate amount: you’d have an extra-ordinarily high amount of cash on you all the time. African institutions are reacting to this market situation with technological progress: Card payments are possible everywhere and people are used to paying through alternative payment solutions. Mobile Payments have been around in Africa for years. Have you ever heard of a BVN? The Bank Verification Number is similar to a social security number in Germany. It is not connected to a particular bank or account. Every citizen of e.g. Nigeria that wants to open a bank account first needs an individual BVN. Thanks to a biometric identification system that was implemented by the Nigerian Central Bank, everyone can be verified via fingerprint scans or facial photographs through their BVN. Given the technologically advanced system we were able to build a solution together with an African fintech startup in 2017 that allowed users to register with an online bank on basis of the BVN. The user merely needs to enter their BVN and birth date and next, he will be asked to take a selfie. If taken correctly within the grid shown on screen, the app is able to verify the user within a fraction of seconds. 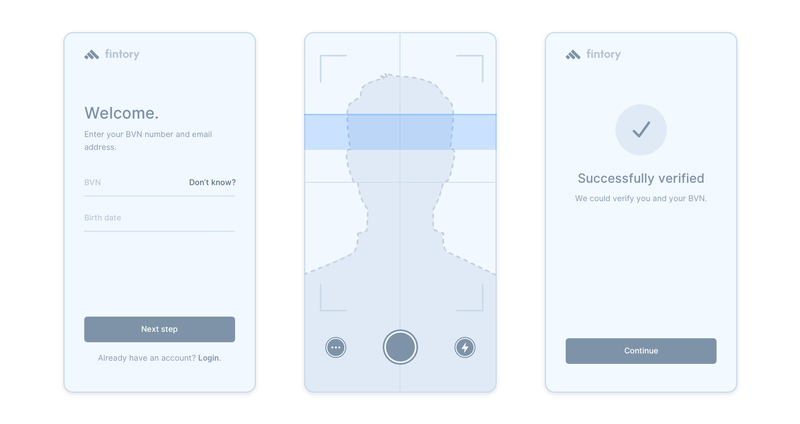 It calls an API that checks the biometric data recorded by the user with the picture connected to the BVN. On basis of this system, African banks and financial institutions are able to drastically improve their customer experience. Registration takes no longer than a few minutes. In a few banking applications we developed for financial institutions in Africa we were working on different variants of bill payment services. These services are a central feature that allows users to make use of different service offerings like telecommunications, PayTV or utilities like energy. Users can also gain transparency by being able to manage all their services centrally. Users can choose from a variety of categories and then buy digitally. Services are booked instantly and shown in the users overview. 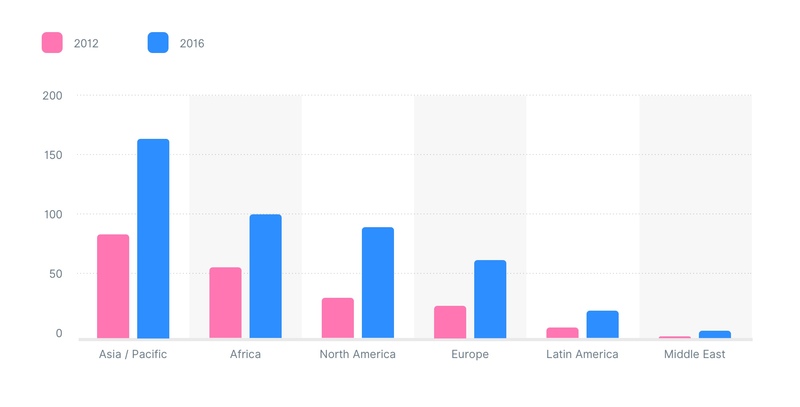 Within four years the market for mobile payments in Africa doubled in size. The startups and companies that shape the finance market across different African countries are pioneers of digitalisation. With their innovative solutions they show that it is possible to address user needs by challenging existing systems and instead adapting to the actual situation. In Africa, banking apps are not only an assistance but more of a lifestyle product. They guide their users and offer a variety of features that simplify the interaction with finance. From a struggle with traditional means, in this case the challenges with currency conversion, a new digital approach arises. Within a few years the mobile payments market in Africa grew exponentially – and more and especially better solutions are constantly being developed. Among them, systems to avoid and manage fraud cases or management tools for companies that offer digital credit cards to employees. Together with our clients from Africa we develop these solutions as web-based apps, mobile apps and entire application systems. And we’re always curious to see what the future has to offer for the African market, but also how this might impact digitalisation in Germany and Europe.